After making a series of successful advancements over the last ten days, the Syrian Armed Forces were able to recapture and free six neighborhoods in East Aleppo from Islamist armies. The Syrian Armed Forces, with the help of Russian troops, rescued and evacuated approximately 18,000 civilians to safety from East Aleppo to Syrian Army protected West Aleppo. The Syrian Army had given the Islamists notice in advance that if they would put down their weapons and turn themselves in they would be given safe passage out of Syria to return to their home countries. Approximately 650 Islamist opposition fighters turned themselves in to the Syrian Armed Forces. The rescued civilians had been unable to flee when the Islamist armies captured their neighborhoods and many had been trapped in these neighborhoods as early as 2011. ​Russia has sent its elite sappers to Aleppo to de-mine buildings in the recaptured neighborhoods. A Russian mobile hospital was also sent to the outskirts of the neighborhoods to treat wounded civilians. Many Islamist cells remained and snipers fired at civilians trying to escape. Over 200 soldiers and 47 vehicles will be engaged to clear Aleppo from mines placed by the Islamists. In March, after the liberation of Palmyra, Russian bomb squads defused mines placed by the Islamists throughout the city. For 45 days the Russians cleared approximately 2,500 buildings from mines, first in the historical part of Palmyra, then in residential areas, defusing 17,500 unexploded bombs. Sniffer dogs were used to de-mine the UNESCO World Heritage site along with Uran-6 bomb disposal robots. 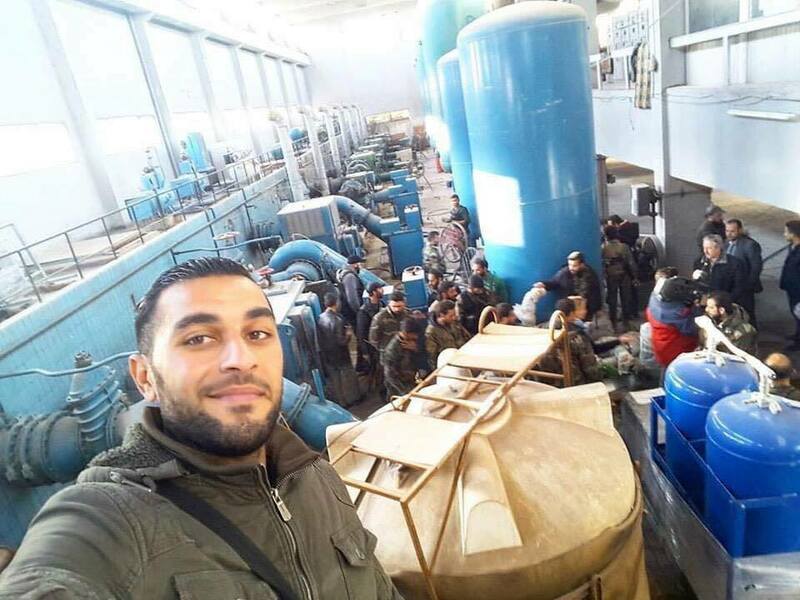 Photo right: The Syrian Army recaptured the water pumping station from U.S.-backed "opposition" who were depriving civilians of water in East Aleppo for over a year. Water had to be brought in via humanitarian efforts by the Syrian and Russian governments, but even humanitarian efforts were prevented from entering at times due to opposition attacks on aid trucks. "They demolished our houses. I ask God to burn them as they burned our houses. I am a Syrian, son of a Syrian, and this is my land. I am proud to be Syrian. Militants who represent Saudi Arabia, just for the dollars, they left us with no food, no drink. For six years - no food, no drink, no homes - we've become homeless. Humanitarian aid was stolen from us ... "
Elite forces of the Syrian Army go door to door to rescue any remaining civilians and to check each building for any remaining terrorist cells. These neighborhoods had been captured by the U.S.-backed Free Syrian Army in 2011 and were systematically destroyed into rubble and then used as a base for their operations. Remaining civilians who were unable to escape have been held hostage for years. Women were forced to veil themselves and hide. As civilians run to safety with the help of the Syrian Army, terrorist snipers shoot at civilians, including shooting at children. Video Below: ​Syrian soldier met with his sister in an eastern Aleppo neighborhood after he helped to recapture it from the terrorist opposition groups. This was his own neighborhood. He had not seen his sister in five years. The scene is very heartwarming. Women especially were in danger in these Islamist controlled neighborhoods. They were forced to veil themselves and were in so much danger most remained indoors. As neighborhoods were recaptured, the Syrian Army helped civilians through safe corridors where trucks and vans were waiting to re-locate civilians to safe areas protected by the army. Food and housing is provided for by the government. Medical and psychological help for the transition will be provided as well. These people have gone through hell for years. The Islamist opposition groups are barbaric, enforcing Islamic Law and conducting various harsh cruelties. Video below: As the Syrian Army goes building to building to rescue remaining civilians and to check for terrorist cells they find gas canisters used for home made rockets the terrorists use for their "Hell Canons". The Hell Canons are what were used to systematically destroy the neighborhoods. You'll see a white flag and Syrian flags waving to let the army know these are civilians who want to be rescued. Video Below: During some of the evacuations, civilians were shot at by snipers. But overall, the recapture of East Aleppo was completely successful and people were relieved to finally be released from captivity. As you can see in this video clip, children gave the victory sign and there were smiles of relief to be rescued.